Long before Barbie and Ken shacked up in a clumsy pink plastic hunk of a house complete with pink convertible corvette, shag carpeting and shaggier yet bean-bag chair, dollhouses existed outside the realm of childrens' playthings, captivating the imaginations (and bank accounts) of adults who took them very seriously and relished the meticulous creation of their extravagantly detailed lives in miniature. 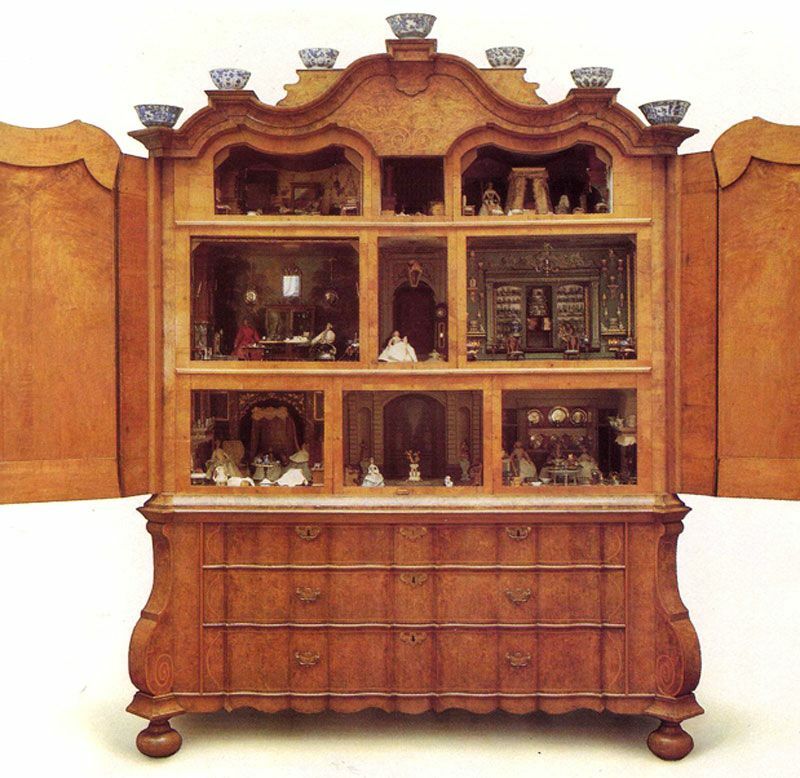 Above, In 1743, Sara Ploos van Amstel-Rothé, a Dutch merchant's wife, employed a different craftsman each for the ivory work, copper and brass, earthenware, and ironwork in her two dollhouses and Below, then commissioned another artisan to build a cabinet to encase it. 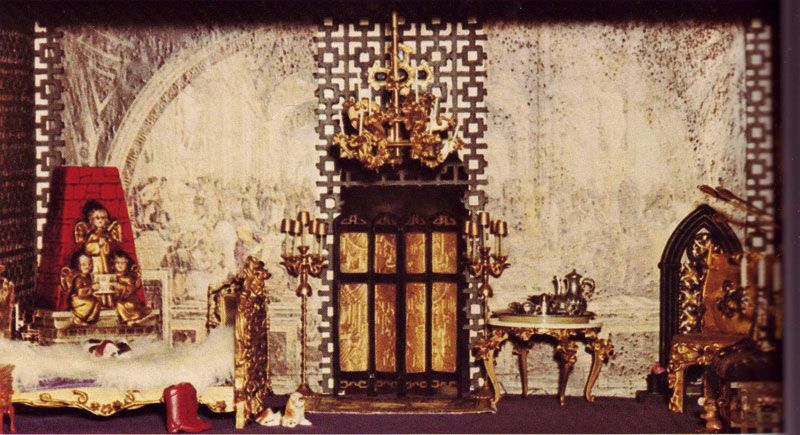 Above, the cabinet that Sara Ploos van Amestel-Rothé had built to house her dollhouse, and Below, the entrance hall(complete with once functional clock), impressive "Collection Room" filled to the brim with fashionable blue and white porcelain, and bedroom, complete with furnishings specifically designed for a pregnant woman. Above, sumptuous colors and fabrics punctuate a miniature by James Payne and Thomas Chippendale, c. 1740-45. 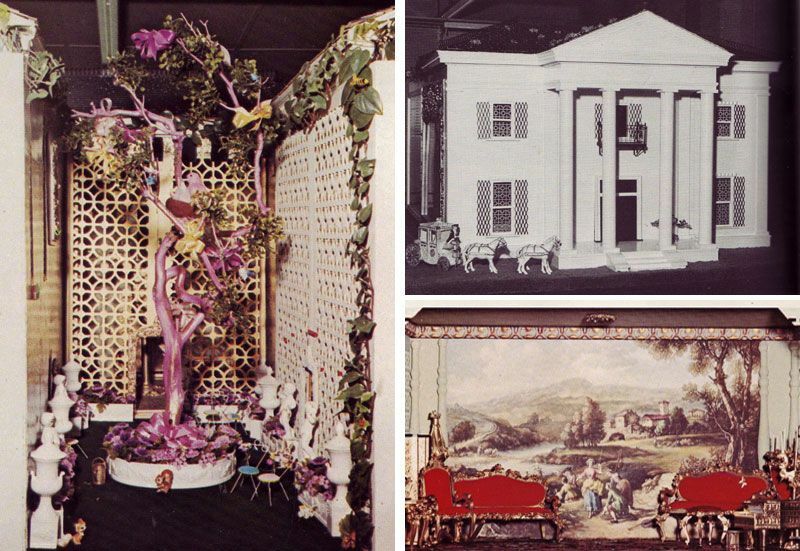 Below, Jeanne Overbeck built Overbeck Fantasy Castle in the 70s to "delight children" with a theme of "when Knighthood was in Flower." Interestingly, some of these rooms remind me of Tony Duquette's work. 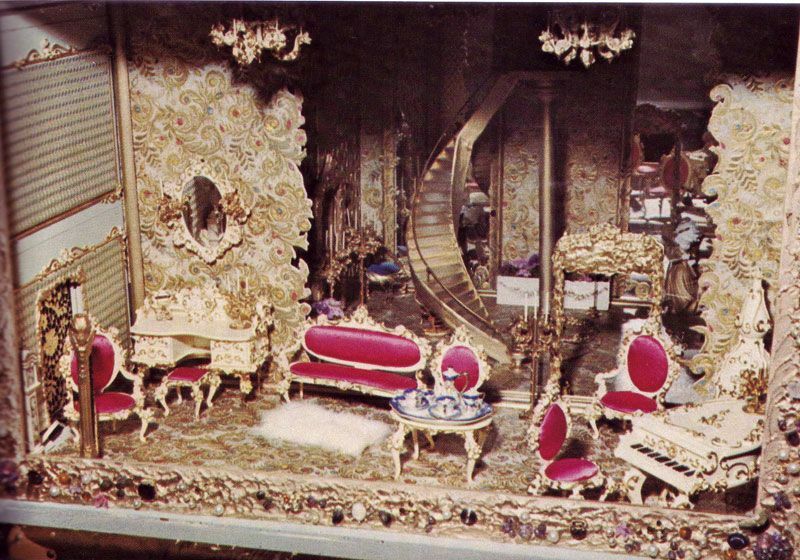 Images from: Connoisseur, December 1984, House & Garden, November 1985, and The Collector's Guide to Dollhouses and Dollhouse Miniatures, 1974. Love this! My mother-in-law was the beloved niece of the family Jay Gatsby like uncle. He had a doll house made of his Georgian mansion for her and had furniture made that replicated the furniture in the house. Sadly, the house does not remain. I have a few trinkets and lots of stories to play with. I am speechless. 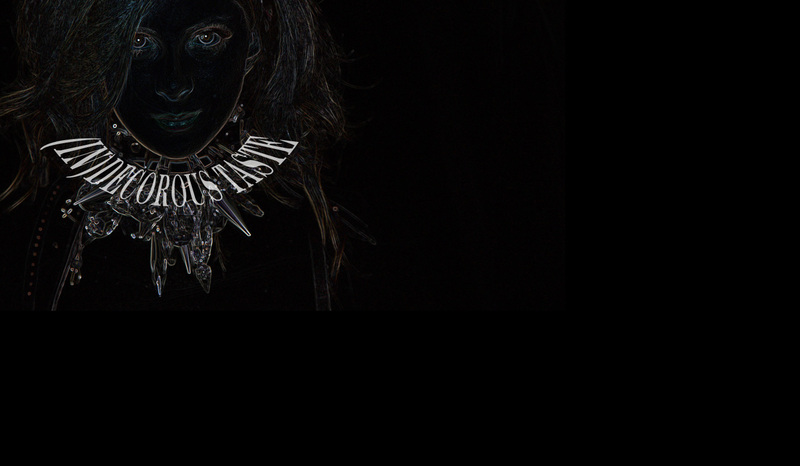 I saved this post on bloglovin because it's so amazing. I can't believe the level of detail that went into each room. So stunning. I absolutely love this post! These are absolutely beautiful! I used to have a 4 story hand-made victorian doll-house mansion as a child. The couple that built it for me started me off with some beautiful furinture...However i was not allowed to buy additional expensive furniture and wallpaper for it, as i was 4 and had no idea what i was doing. So it sat there empty until my parents handed it off to a loose family friend. I dreadlfully want it back. I'm still bitter about it to this day. hahaha. oh, PS Tony Duquette totally! Oooo I'm SO excited, I love this. I always wanted a dolls house (bit more humble than these). They are just magnificent, just amazing what people can build. I wonder if anyone played with them! Homebeforedark: That is so fascinating that you have a story like that in the family, even if the house no longer exists! Maria: Glad you like it! Little Augury: This made me laugh, I remember being 10. 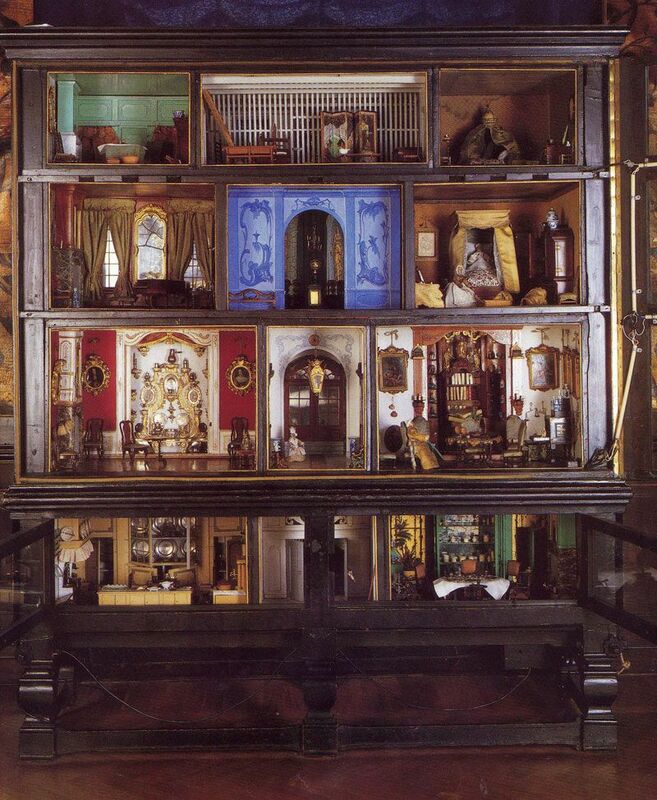 Robyn: I had a Victorian dollhouse as a child too! Luckily for me, my mom got really into it, laid hardwood floors and had me pick out wallpaper for the rooms. I still like the tea stained chintz I picked for the bedroom— it's amazing how some things never change. Soodie: I think I would enjoy the process of putting together a dollhouse more now than I would have when I was younger! Dustjacket Attic: From what I've read, people didn't usually play with them once they were set up, they just displayed them. The "play" was all in creating the interiors. Uppark House in West Sussex also has a glorious dollhouse. I was very struck to learn that the English class system had even manifested itself in the make-up of the dolls - those who were the "masters" of the house were made of porcelain while the servant dolls were made of wax. I'm in awe. Those are so stunningly beautiful. You can tell that so much detail and craftsmanship went into their creation. wow this is amazing. thanks for the comment, and for the visual feast! EEE- Wow, that is so interesting. They didn't miss a single detail, did they? 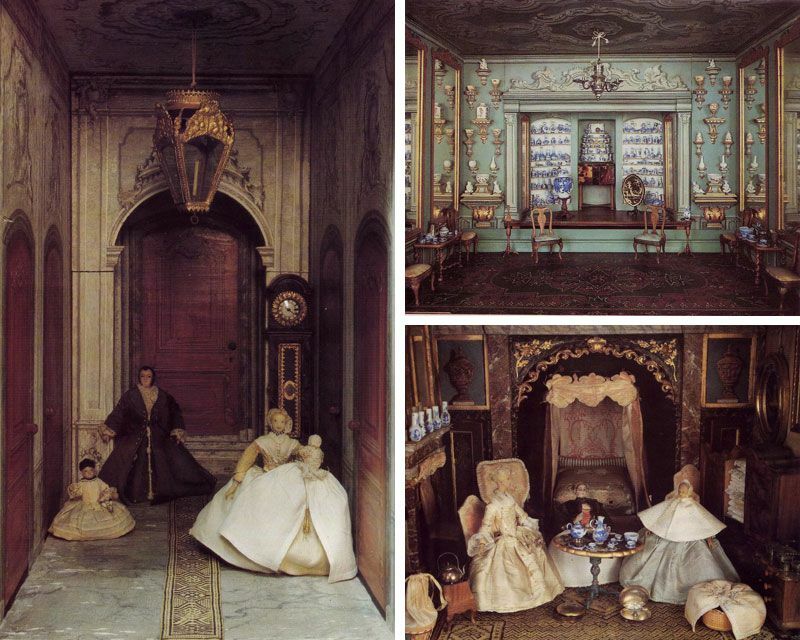 Thanks for the tip on the Uppark House dollhouse, too. I will definitely look into that. I seriously think I would have died and gone to heaven if I had a doll house like any of these when I was little, actually I think I still would! Son una preciosidad, estos estilos antiguos tienen algo especial, un encanto inigualable.